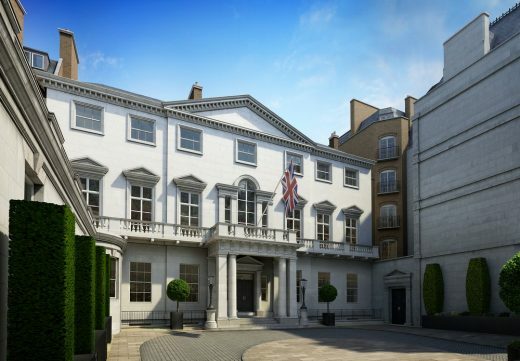 Heritage driven scheme approved at Westminster City Council committee paving way for 102 key five star hotel and 7 apartments on site of the former In & Out Club and adjacent properties. PDP London were appointed by Tower Properties Management Ltd to submit proposals for a new scheme for hotel and associated residences at the site incorporating the Grade II listed 90-93 and 95 Piccadilly, the Grade I listed 94 Piccadilly as well as the properties at 42 Half Moon Street, 10-12 White Horse Street and 12 Shepherd Market. The scheme has been developed with a full design team, including input through pre-application discussions with both the City of Westminster and Historic England, and a public consultation exhibition. 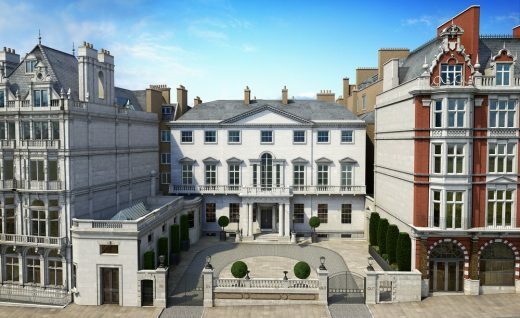 The scheme is centred around Cambridge House; the former residence of Henry John Temple, 3rd Viscount Palmerston whilst he served as Prime Minister. The building was built in 1764 and was originally known as Egremont House. It is a rare example of an ‘Hôtel Particulier’; a formal architectural set-piece arrangement typical of 17th century French design, where the house is set back from the street and is fronted by a private courtyard. 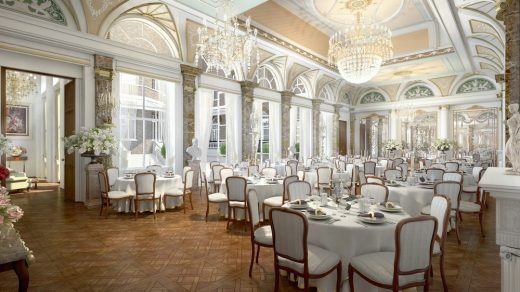 The scheme proposes a new signature chef restaurant and hotel bar, both accessible to the public from Piccadilly, a spa with pool, cellar wine bar, classically finished lounges, meeting rooms and grand ballroom. The hotel will be approached from the existing ‘In’ gate to the front courtyard. The ‘In’ and ‘Out’ gates that give the property its colloquial name, were originally reversed to allow horse drawn carriages to enter and leave the courtyard in a continuous circle. In addition to the retained buildings, the scheme features an equal quantity of new build construction that will enable guests and residents to benefit from an exceptional degree of amenity. Guest rooms are exceptionally large throughout and the scale of the grandest suites, with their ornate 5.4m high ceilings, are truly of a different age. The ground floor entrance lobby is proposed to be modified to establish a visual connection of spaces and symmetry creating an entrance experience befitting 94 Piccadilly’s grand, Palladian architectural style. A two-faced clock is proposed to be relocated to open up the connection between entrance lobby and grand stair, where the non-original balustrade will be replaced with a more authentic historical design. 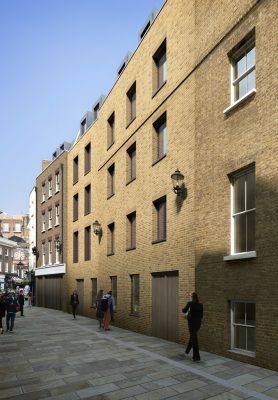 The restaurant will be over two storeys with connecting lightwell and theatre kitchen with seating available in the existing vaulted spaces below Piccadilly. The original shopfront design of cut glass and geometric window arch infills will be restored to form the restaurant windows based on found historic photographs and original design drawings. The piano nobile; the principal floor at Cambridge House, is arranged in ‘enfilade’; that is a suite of rooms formally aligned with each other, in this case arranged around the central stair. 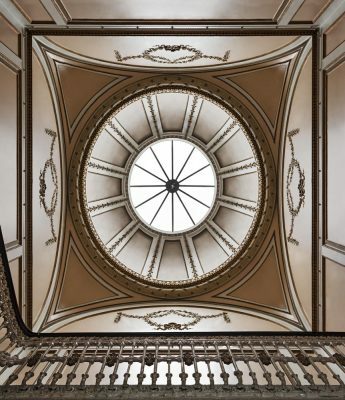 This historic arrangement of spaces, including the octagonal, former study used by Palmerston, will be made available to the public to experience during Open House weekends giving unprecedented public access to this formidable example of London and British built history. The scheme includes a lower ground level and three further basement levels to accommodate the spa as well as all of the back of house and servicing a hotel of this order requires. All required areas of the hotel can be run and accessed by hotel staff with minimal impact on the listed buildings whilst providing guests with seamless service. Servicing is to be undertaken from White Horse Street via an off-street loading bay where deliveries will be efficiently transported to basement levels for processing and distribution around the scheme. The scheme provides 7 apartments of varying sizes that will benefit from being fully serviced by the hotel. Affordable housing was not pra¬ctical to provide on the site and therefore the applicant is making a payment in lieu of this. Detailed design and enabling works will begin in the new year. Having remained vacant and neglected for almost 20 years, one of London’s iconic buildings, is finally embarking on the road to its resurrection.